A Mother’s Kiss was formed in 1994 by Eileen and Guy Eger of Long Island, NY. That same year, their son Kevin Eger succumbed to cancer following a long and courageous battle with neuroblastoma. Eileen and Guy realized that through the treatment process (and in many cases, afterwards) the families of childhood cancer patients must endure financial and emotional hardships which are not recognized by the general public, employers, and insurance companies. Family and friends, whose support would otherwise be an important part of the healing process, are often not sure how to approach their fallen family members or friends. It is difficult when a child so close to them has suddenly become very sick. By eliminating some of the stress in the lives of these emotionally and financially challenged families, we allow them to concentrate on what is really important – making sure that their beloved child gets better. It was the Egers’ vision that no family should have to endure these hardships alone. It is for that reason that A Mother’s Kiss was formed. Since that time, A Mother’s Kiss has evolved into the most dedicated Board Members, Officers, and Volunteers available. 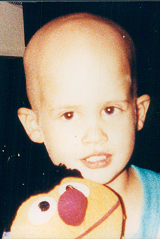 We continue to carry out the Eger’s philosophy that no child should fight cancer alone.